The Federal Reserve didn't hike interest rates last week. Critics -- even some within the Fed -- publicly lambasted the decision.. But Fed Chair Janet Yellen has a message for them: We made the right call. Yellen argued Thursday that the persistently low inflation warrants the Fed's rates to currently be at zero. 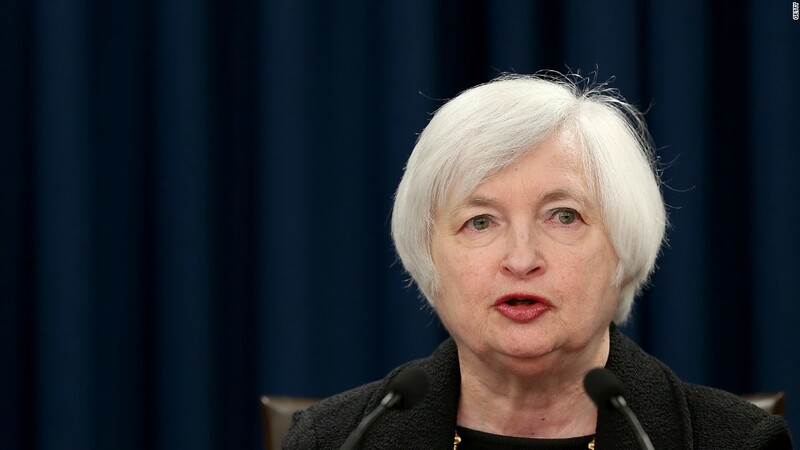 But she reiterated again that a rate hike by the end of the year is likely. "I anticipate that it will likely be appropriate to raise the target range for the federal funds rate sometime later this year," Yellen said in a speech Thursday evening at the University of Massachusetts. Yellen also argued that the Fed can't keep rates at zero too much longer because extremely low interest rates might encourage investors towards "inappropriate risk-taking that might undermine financial stability." Yellen believes that U.S. inflation will move toward the Fed's 2% target. Despite low inflation for years now, Yellen says temporary factors like low oil prices are holding down inflation from coming up to a more normal level. She argued that low oil and gas prices are a big reason why inflation has been so low in recent years. "Falling consumer energy prices explain about half of this year's shortfall and a sizable portion of the 2013 and 2014 shortfalls as well," Yellen said Thursday. Yellen's speech focused almost entirely on the U.S. economy, a key difference from her press conference last week where she talked for a considerable time about her concerns regarding the global economy (read: China) and stock market volatility (she briefly touched on those points Thursday). However, Yellen reiterated that she thinks the Fed will likely raise interest rates sometime "later this year." The Fed only has two meetings left -- one in October and the other in December. The stock market has sold off sharply since the Fed didn't raise rates. The Nadsaq has erased all gains for the year and the Dow is back below its 10% correction level. Investors have been "dazed and confused" by the Fed's plans -- and whether the global economy is going to be a drag on America. Keeping in her even-handed style, Yellen said that if the economic outlook worsens later this year, the Fed could push back a rate hike until 2016. "If the economy surprises us, our judgments about appropriate monetary policy will change," Yellen said, ending her speech. Yellen had a brief health scare at the end of her speech. She received some medical treatment for dehydration but later continued with the rest of her schedule Thursday evening, according to a Federal Reserve spokesperson.